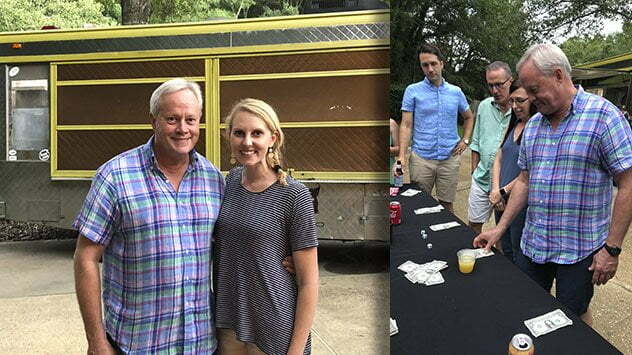 Left: “Today’s Homeowner” hosts Danny Lipford and Chelsea Lipford Wolf celebrate the show’s 20th season during the wrap party. Right: The TH cast and crew play a cash parlor game called LCR. The “Today’s Homeowner” television show has wrapped taping for its 20th season. Viewers can look forward to one more 20th season episode, “Addition Rescue,” sponsored in part by Carrier, which airs the week of July 23. Meanwhile, the cast and crew have turned their sights toward season 21. The TH team recently met at TH host Danny Lipford’s home for an all-day production meeting. The goal, as always for these annual meetings, was to build on the prior season’s successes and identify opportunities to better serve our TV, radio and web audiences. And, at the end of the day, have fun!